A ringtail visits the backyard almost every night, traveling back and forth along the fence from our neighbors’ yard to ours. 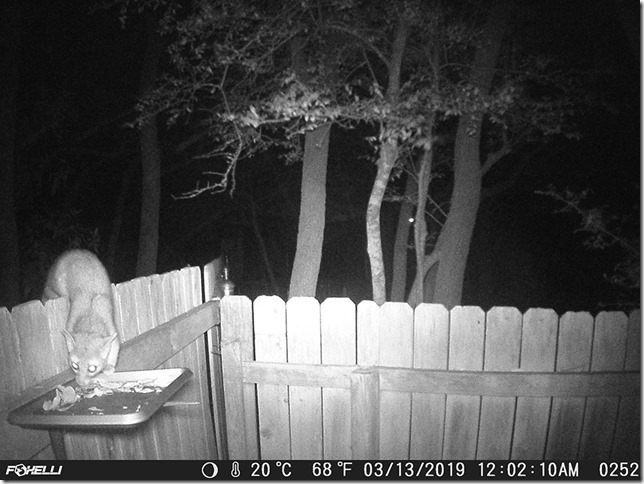 We keep a small feeder tray filled with orange peels and dried fruit to entice him and birds, but the menu also appeals to a local possum. 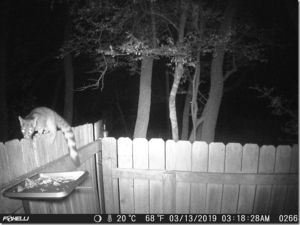 One night the trail cam caught both possum and ringtail at a standoff as they chased each other down the fence and out of the yard. The temperature fluctuated wildly this week, dropping to 27º on Tuesday morning. For a few days it was true winter again with frozen bird baths and outdoor faucets covered. I bundled up in my Eddie Bauer down coat and dressed Daisy in her Dover blanket. Humidity threatened rain all week, but it simply misted, making the world feel even colder. By Wednesday it was sunny again, at least in the morning, and by Thursday and Friday the temperature climbed to low 80s. Standing in the pastures at Scattered Oaks, it felt like a lazy summer afternoon. Many of the bucks still have their antlers though we expected they would have shed them by now. 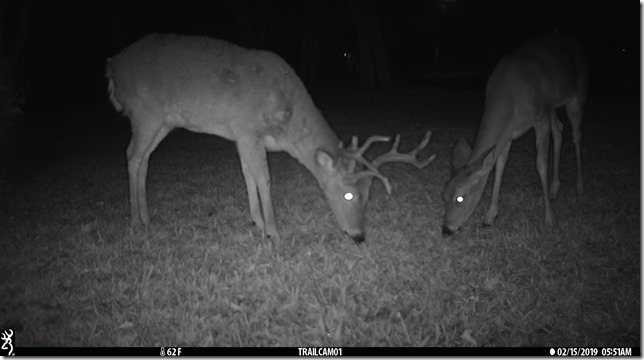 The does and bucks still travel in separate groups, except for Scruffy and his friend, while the coyotes and foxes come and go, sometimes in pairs and sometimes alone. Bluebonnets are sprouting everywhere, adding color to the neighborhood and along the roads. One of the farms along Lockwood Springs Road is spread with Indian Paintbrush. Turning the corner from Blake Manor Road, you are greeted with a blanket of green and coral. Redbuds are in full bloom as are Bradford pears. Mountain laurels are in full bloom and other fruit trees are catching up with tiny white or pink clusters of flowers. Even though it’s not officially spring yet, it feels like it.